My name is Lavinia Anne Culshaw, this is my story about a wonderfully happy & formative childhood in Thornborough in the 1950s. I was born in my parents’ bedroom in “Lindene”, Thornborough on March 12th 1950 to Margaret & George Howard. March 12th was my Mum’s birthday and she told me that I was her best birthday present ever! She didn’t always tell me that with some of the escapades & scrapes I got into as I grew up. There is evidence of Bronze Age activity around Thornborough, particularly near the river. Archaeologists think that when the Romans invaded Britain a battle took place between their armies & the local people near to Thornborough Bridge. The bridge next to the present road bridge dates from the 14th Century. It was on this bridge that my very first car, my pride & joy, after months of hard work & scrimping & saving was written off. I learned the hard way that cars are not like books & easy to lend. I had to start taking holiday jobs & save all over again. The farmers were most tolerant of us. We were always roaming the fields & spinneys. We would be sent out “wooding” in Winter & would drag sacks of wood home, sometimes they would be so heavy because we were such efficient gatherers, that we would have to make several journeys. We would also collect sacks of dry fir cones from Roger’s Spinney. These burnt so cheerily & we felt such a sense of achievement that we had made our contribution to family life. At Christmas time the fir cones would be painted white, for snow, or silver & gold for decorations. Other ways in which we contributed were many. Granny would give us leather, gallon measures & send us up Uncle Jack’s fields to pick a few gallons of cowslips or dandelions for wine making. In the Autumn we would be up by six in the morning to get the mushrooms, with the dew still on them & the wet grass soaking our shoes, over Cofa (all the fields had names) or later in the day we would be gathering blackberries for jam, jellies & pies. Sometimes Pam & I would long for a few sweets so we would go into the meadows & pick bunches of buttercups & then go & knock politely on Freda Newman’s door & kindly inform her that we had picked flowers especially for her. It usually worked; she would give us a penny or two! We tried this trick all round the village visiting Mrs Jackman, Freda Brock, Lily Palmer, my Granny & Grandma. Sometimes it worked & sometimes it didn’t. Mr & Mrs Harley were good for sweets. They always had a supply of home made fudge & would give us a couple of squares which would settle our cravings for a day or two! I liked their chocolate fudge best & we always hoped Mrs Harley would open the door as we couldn’t always rely on Mr. Harley being child-friendly! Pam & I got up to all sorts of adventures & escapades. One memorable foray into where we had no business, was into Pam’s Mum’s henhouse. We had a good old explore but couldn’t make out why we itched so much. We were covered in chicken fleas & lice. That was unpleasant enough but the telling off & the harsh scrub down was worse. I seem to remember various scrub downs & telling offs. Pam & I had gone exploring over the fields near Ollins Barn. We decided on a short cut back & got stuck in the mud. It filled our wellies & dragged us down; our only chance of survival was to shout for help. This came in the form of Pam’s Dad. He heard our cries from the milking parlour where he was busy milking the cows. We were pleased to see him but he wasn’t pleased to see us coated from head to toe. We had a good whigging then he & Jimmy Tysoe set the hoses on us to clean us up before we went home, suitably chastened… until the next time! My childhood was magical because I was surrounded by loving people. Granny, Grandad & Aunty Anne lived next door. Mum & Dad’s relations lived in the village. These & all the villagers took a hand in caring for us children, chiding us advising us, teaching us. The only drawback in this idyll was having to go to school. Oh how it spoilt the freedom of our otherwise happy days! All of a sudden confined to sit at desks. I enjoyed play times though, & when I was in the Infants Class the older girls like Betty Clarke & Daphne Sewell used to look after us & give us piggy back rides around the playground. The teachers seemed austere, distant & unsmiling. After my first day, I announced to Mum & Dad that I had been to school & now would leave like the older village children. It was a hard thing for a tiny free spirit to understand that you were now in a vice for at least ten years. The next morning after a great deal of crying & arguing, Mum dragged me across the road to my doom. I caught sight of Grandad & grabbed hold of the pond railings, screaming, “Grandad save me, save me.” Despite a desperately strong hold, my little hands were prized off the railings & I was forced into that dreadful place of grim faced grown-ups. I hated [primary] school & the best thing about it was coming home in the afternoon. Mum was always there with tea on the table. We were allowed out to play but we also sat with her & did reading, writing, spelling, games & colouring or making things. Mum read to us every night & on a Saturday she would take us into Buckingham to the library, where we were allowed to browse & choose three books to take home. I felt really privileged & grown up when I could take four books home. We loved books & on wet days we would look through them again & again. Jen used to save her pocket money to buy “Observer Books” when we went to Bletchley shopping, & I would save my money to buy “Ladybird Books”. Through poring over these time & again, our knowledge of the world around us increased. As Jennifer & I grew older, Mum & Dad would make a big effort to take us to the seaside every year for our holidays. We travelled by train to Margate, Weymouth, Blackpool, Paignton. When we were teenagers we had the thrill of travelling to Cornwall on the night train & slept in bunks in our own compartment. Sometimes disasters occur & the villagers all rally round. Floods were quite a common occurrence & the village would be cut off. In 1958 there was a huge flood. The waters came up our stairs. Mum & Dad had lifted as much stuff out of the way before the water entered our house & Granny & Grandad’s house. We were all upstairs & watched as people came down from the top of the village to shout & ask if we were alright. Some people were trapped in The Two Brewers! Apparently the barrels were floating around in the cellar. People sloshed about on the edge of the water & the next thing we knew, Mr. Whitbourne had rowed his boat down the High Street, up the garage drive, across the garden to the back door! Jen & I were bundled up & sent off in the boat to Aunty Anne & Uncle Roy’s house at the top of the village. Aunty Anne had not long given birth to Alison. So there was plenty of excitement all round. More floods occurred in 1964 when I was baby sitting next door at Sturdy Cottage. By now I knew the drill: watch the water & as soon as it gets across the road start emptying things from low cupboards, make plans for stacking furniture, fill jugs with clean water to take upstairs & above all keep an eye on the water level. On this occasion the water continued to rise & came over the garden wall. I stacked furniture & had already emptied the cupboards. When I could do no more & was sloshing around waist high in water the only thing I could do was retire upstairs & sit in the bedroom window & watch the water level. People make a mistake at this point & go to sleep. You must watch the water level & as it goes down you get a broom & sweep out as the water goes, in this way you avoid a great layer of stinking mud over everything. Our family continued to thrive but happy childhood days in Thornborough were beginning to change as we grew older. Having attended St John’s Royal Latin School in Buckingham, Jennifer went to Durham University. 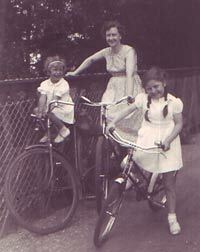 Later she married Ken Johnson & they had two lovely daughters Lucy & Anna. I also attended the Latin School, as had Dad & Uncle Roy, we all had the same Latin teacher (“Taffy” Williams) & the same physics teacher (“Tommy” Allitt). I eventually trained as a teacher. This job led me to overseas postings & I met Peter Culshaw & married him. We had a wonderful life together & lived & worked all over the world. From time to time we would return to England to see our families & enjoy outings together such as boating on the canal. Sadly most of the family – Mum, Dad, my husband, Aunty Anne, Uncle Roy, Granny, Grandad & Grandma have died. My main link with Thornborough is to visit & tidy the graves there. The church was important in childhood as Grandad was Church Warden so we were expected to go to at least one Sunday Service a week. Aunty Anne played the organ & on a Thursday I would accompany Mum & Granny & help them with the church cleaning. My job was to straighten the hymn books & have my yellow duster & dust the hymn book shelves at each pew. In the Summer months, when I was a child, Grandad, Dad & Uncle Roy would take turns at mowing & tidying the churchyard. Jen & I would help in the hope that we would earn some money for books for her & sweets for me. Grandad used a scythe & a billing hook. These always fascinated us as being old fashioned & we always nagged to “have a go”. Living opposite the church meant that christenings, weddings & funerals were just a very short walk away. It is still a lovely church & the church yard is a pleasant & peaceful place with the sheep next door in Lime’s Close, I always think “Rural England at its best.” I think this little phrase sums up Thornborough Village very well & long may it continue to nurture & form future generations of free spirits. I believe that Lavinia’s father, George Howard, an Old Soldier as well as an Old Latin, used to attend the annual Remembrance Day service at School, certainly until I retired. My memory suggests that he used a nickname – was it “Tony” ? – to distinguish himself from other Georges in the Howard family.